The students of the Wagga Wagga and Newcastle Teachers' Colleges played a game of hockey during Newcastle's Intercollegiate visit to Wagga. The students of the Wagga Wagga and Newcastle Teachers' Colleges played a game of netball during Newcastle's Intercollegiate visit to Wagga. The students of the Wagga Wagga and Newcastle Teachers' Colleges played a game of basketball during Newcastle's Intercollegiate visit to Wagga. The students of the Wagga Wagga and Newcastle Teachers' Colleges played a game of tennis during Newcastle's Intercollegiate visit to Wagga. The Newcastle Teachers' College and the Wagga Wagga Teachers' College students playing softball during the Intercollegiate week held in Wagga in 1956. The Newcastle Teachers' College and the Wagga Wagga Teachers' College students playing soccer during the Intercollegiate week held in Wagga in 1956. 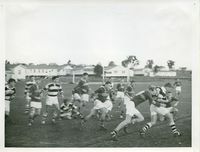 The Newcastle Teachers' College and the Wagga Wagga Teachers' College students playing rugby union during the Intercollegiate week held in Wagga in 1956. Wagga Wagga Teachers' College students playing rugby against Bathurst Teachers' College students during Intercollegiate week in Wagga in 1954. The Wagga Wagga Teacher's College hockey team who played against Newcastle Teachers' College during Intercollegiate week in 1956. Newcastle Teachers' College students and a teacher arriving at the Wagga Wagga Teachers' College campus (corner of College Ave and Charleville Rd) for Intercollegiate week, 1956. 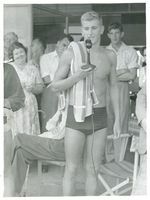 Wagga Wagga Teachers' College student, Bob Ford, making a speech at the Bendigo Olympic Swimming Pool, during an intercollegiate to Bendigo in 1958. Wagga Wagga Teachers' College students play basketball against Newcastle Teachers' College during Intercollegiate week in 1964.